When I was younger I loved, loved, loved eating Manischewitz borscht cold with sour cream on hot summer nights. Of course this is not something I can buy in France, and I certainly don’t want to ask anyone to ship a glass bottle full of purple beet juice! I’ve never been able to find a recipe for borscht that quite matches the taste of the Manischewitz- it must have something to do with the quantity of sugar that they add, but I love the taste of beets all the same. 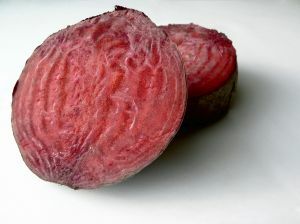 In France you can easily find precooked beets sealed in vaccuum packs in the cold aisle of the grocery store. They are fantastic, already prepared, easy to slice and serve, full of nutrients, and, oh yeah, yummy. In case you can’t find precooked beets, and I’m not talking canned here, this article from the NY Times describes one method of cooking them. One of my favorite recipes with beets is a simple salad. Diced beets, grated carrots, chopped tomatoes and flaked tuna. I make a variation of a coleslaw dressing and its delicious. Previous post: Introducing Almost Frugal Food!